Fight Club: Rousey returns but is her importance diminished? 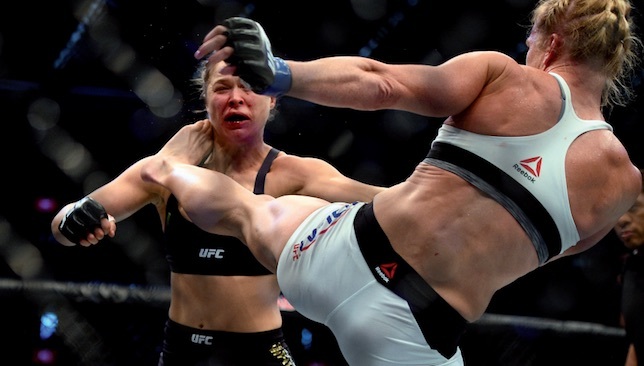 Kicked from the top: Holly Holm finished Ronda Rousey in the second round. The women’s bantamweight division has had a Ronda Rousey-shaped shadow cast over it ever since she lost the 135lbs title in seismic-shifting fashion at UFC 193 in November. In the immediate aftermath of Holly Holm’s devastating head-kick finish, all the talk centered around Rousey’s return. It’s long been the case that the success of women’s MMA ran parallel to her transcendent triumphs and the defeat, and the nature of it, had many pessimistic about its future. No longer, though. Now, there’s a clear schism between the two. While the 29-year-old has resided in darkness, making no clear indication of when she plans on returning to the Octagon, the division has gone on to flourish in her absence. Indeed, it’s now grown into one of the most absorbing in the UFC and if past history is anything to go by, no single individual is bigger than the fight game. The last nine months have added credence to that. The promotion has always bounced back when its biggest stars have departed. From Chuck Liddell to Georges St-Pierre, there are always personalities ready to step onto the carousel. MMA is just too fluid and the narrative is forever shifting. Spend too long away from the light and the attitude of ‘out of sight, out of mind’ invariably comes to fruition. So when UFC president Dana White claimed this week that Rousey’s return would topple all promotional PPV records set by Conor McGregor, it was rightly met with a raised eyebrow. Undoubtedly, she still remains one of the sports most bankable stars but as time moves on her draw diminishes. The bantamweight division is no longer reliant on Rousey inhabiting it, and in turn, neither is the UFC. The landscape of 135lbs has shifted from an era of dominance, to a period of upheaval and arguably the latter has strengthened its appeal. Rousey’s iconic Strikeforce and UFC championship run saw her decimate the division and allowed her to engineer a global presence. But now the sport has moved on, it’s unlikely will see a run like it again. It all means that her expected return later this year will not bear the same weight it once carried. UFC stars Stephen “Wonderboy” Thompson, Joseph Benavidez and Elias Theodorou train and spend time with the athletes of Canada’s Special Olympics team while in Vancouver for Fight Night: Maia vs Condit. The fighters put the team through their paces with some pad work and introduce them to mixed martial arts and the training that they do. Who do you think will come out on top after the main event in Vancouver? Have your say by commenting below, using #360fans on Twitter or getting in touch via Facebook. Recap the action from Thursday’s open workout at Fight Night Vancouver, featuring main event fighters Demian Maia and Carlos Condit. Who do you think will emerge victorious come the end of Fight Night Vancouver and what do you make of these open workout sessions? Share with us your thoughts by commenting below, using #360fans on Twitter or getting in touch via Facebook.